NEW YORK, New York — A large delegation of the Hayastan All-Armenian Fund, comprising close to 40 benefactors, Board of Trustees members, and affiliate representatives, continues holding opening ceremonies for recently completed projects and visiting current project sites in Armenia and Artsakh. The project openings and visits are being carried out within the framework of the Board of Trustees’ annual meeting. On May 24, the delegation officially opened the newly built community center of Drakhtik, a village in Artsakh’s Hadrut Region. Dignitaries and guests in attendance included Archbishop Pargev Martirosyan, Primate of the Artsakh Diocese; Rev. Shahe Ananyan, representative of the Mother See of Holy Echmiadzin; Valeri Gevorgyan, head of the Hadrut Administration; and local-community representatives. The festive ceremony was also attended by a large number of Drakhtik residents. “Thanks to our benefactors, this community is being transformed into a real paradise,” said Archbishop Martirosyan in his opening speech, referring to the fact that Drakhtik means “little paradise” in Armenian. The Drakhtik community center has been built and furnished by the Hayastan All-Armenian Fund’s Toronto affiliate, with a donation from Deacon Berge Lulejian. The facility, which has a total area of 283 square meters, will house the mayor’s office, a health clinic, a maternity room, an events hall, a computer lab, and a library. The community center is the fourth infrastructure-development project to be implemented by the fund in Drakhtik, which has a population of 430. 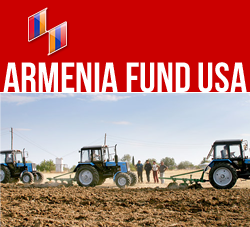 The previous projects comprise a potable-water network, sponsored by the Armenian community of Russia; a beautiful kindergarten, made possible by the French-Armenian community; and an agricultural-machinery station, realized through the support of the Armenian community of the Eastern US. Drakhtik is situated along the North-South Highway, which was built by the Hayastan All-Armenian Fund. Next the delegation visited Karin Tak, a village in the Shushi Region, where the fund has rebuilt the community’s potable-water network. The project, which is co-sponsored by the Greek, Cypriot, Uruguayan, Argentinean, and Brazilian affiliates of the Hayastan All-Armenian Fund as well as the Armenian Relief Society, once again illustrates the fund’s abiding philosophy of mobilizing pan-Armenian support for the realization of vital development initiatives.